Relying on meticulous original archival research, historian Peter Silver uncovers a fearful and vibrant early America in which Lutherans and Presbyterians, Quakers, Catholics and Covenanters, Irish, German, French, and Welsh all sought to lay claim to a daunting countryside. 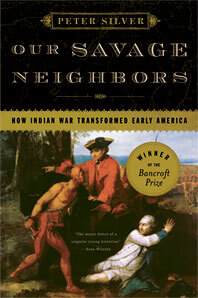 Such groups had rarely intermingled in Europe, and the divisions between them only grew—until, with the arrival of the Seven Years’ War, thousands of country people were forced to flee from Indian attack.Silver reveals in vivid and often chilling detail how easily a rhetoric of fear can incite entire populations to violence. He shows how it was only through the shared experience of fearing and hating Indians that these Europeans, once irreconcilable, were finally united under the ideal of religious and ethnic tolerance that has since defined the best in American life.